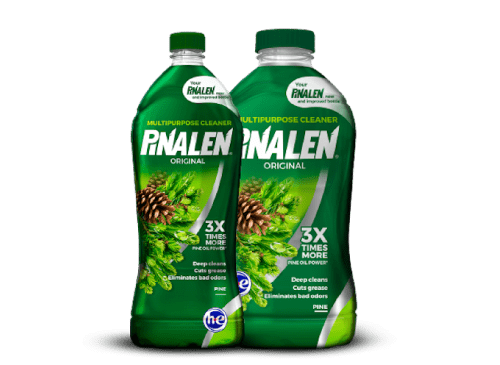 With PINALEN® Multipurpose Cleaners, bathroom dirt, soap scum, and odors have met their match. Eliminate elbow grease by following these simple directions. Clean tiles on walls, floors, or counters without the damaging abrasives found in other cleaners. Use PINALEN® Multipurpose Cleaners directly to clean all hard surfaces. Forget harsh cleansers. 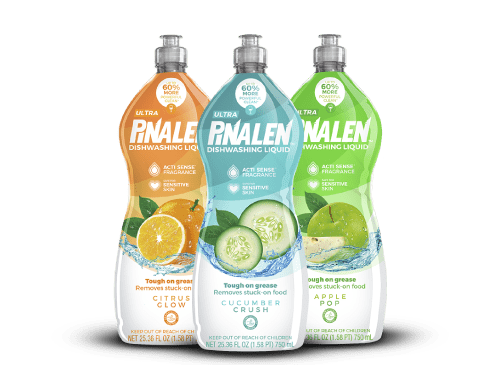 Deodorize your toilet bowl with one of six fresh PINALEN® scents. Dilute 1⁄3 cup of PINALEN® Multipurpose Cleaners in a half gallon of water and scrub gently with a brush or sponge. Soap scum and toothpaste are banished. Dilute 1⁄4 cup of PINALEN® Multipurpose Cleaners in a half gallon of water and clean as normal. It’s the busiest room of your house—it has to shine. With everything you need in one bottle, PINALEN® Multipurpose Cleaners makes it effortless while leaving a long-lasting scent. Stovetops, vent hoods, and kitchen cabinets are grease magnets. No worries. Dilute 1⁄4 cup of PINALEN® Multipurpose Cleaner in a half gallon of water to safely clean and degrease kitchen surfaces. 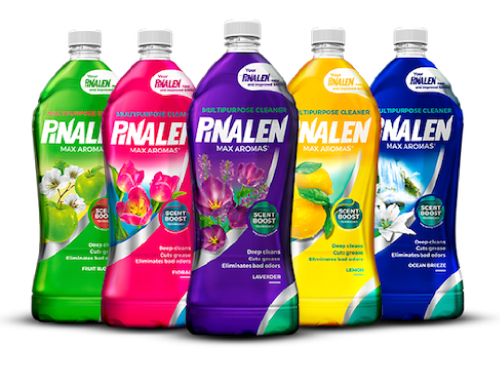 Versatile PINALEN® Multipurpose Cleaners also eliminate laundry odors and stains. Use as a pre-treatment or add with your regular detergent to the wash.
Linens can absorb musty odors when their stored too long. Refresh towels and bedding by adding 1 cup of PINALEN® Multipurpose Cleaner per medium load to your regular detergent. Smelly workout gear? No sweat. Adding 1 cup of PINALEN® Multipurpose Cleaner per medium load with your regular detergent eliminates smells along the gray that comes with age. Use PINALEN® Multipurpose Cleaners to remove dirt, grease, make-up, and even gum. Apply it full-strength directly on stains before adding your clothes to the wash.
PINALEN® Multipurpose Cleaners go everywhere. One multi-purpose cleaning product works in every room, floor to ceiling. You just spilled wine on your favorite rug. No problem. Dilute 1⁄4 cup of PINALEN® Multipurpose Cleaner in one gallon of water and spot treat with a clean rag or sponge. Be sure to test a small hidden area of the carpet for color fastness first. From permanent markers to handprints, kids make the darnedest messes. That’s okay. Dilute 8 fl. oz. of PINALEN® Multipurpose Cleaner in 80 fl. oz. of water to remove stains. Clean dust and grime from ceiling fans and decorative home furnishings. Add 1⁄4 cup of PINALEN® Multipurpose Cleaner to a half gallon of water, apply and clean. Add 1⁄4 cup of PINALEN® Multipurpose Cleaner to a half gallon of water and wipe down the interior of trashcans and wastebaskets to remove those strong, lingering smells. Animals are loveable. Smells are not. Dilute 1⁄4 cup of PINALEN® Multipurpose Cleaner in a half gallon of water, then wipe down hard surfaces around the area in which your pet sleeps. It’s strong enough—yet gentle enough—to use on linoleum, laminated hardwood, or tile floors. Dilute 1⁄4 cup of PINALEN® Multipurpose Cleaner to a half gallon of water and mop. No need to rinse. PINALEN® Multipurpose Cleaner are non-abrasive, which means you can use it daily on Formica® or laminate countertops to clean and freshen. Dilute 1⁄2 cup in a half gallon of water, clean with a sponge, and rinse.